Free Lyrics Finder comes pre-configured. This means that you can simply install the program and start downloading lyrics for your MP3, FLAC, APE, or other music files. However, you can find certain adjustments and useful tweaks in the settings menu of the program. There are several tabs, with "General" opened by default. Here we will describe the available options on this tab. 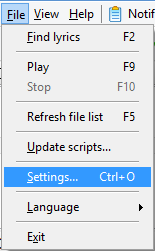 "Show hints" enables showing popup hints when you move the mouse cursor over this or that control of the program. Additionally, hints are displayed in the status bar of the program (at the bottom of the main window). "Search for lyrics when only the title of the song is available". Sometimes tags contain information about artist and title in the title field (instead of putting artist into the artist field). This option allows recognizing these situations and extracting artist and title information from the title field. It expects these data in the "Artist - Title" format. "Search for lyrics using filenames". If your files do not have any tags at all, but their filenames contain necessary information, Free Lyrics Finder can download lyrics for such files. It expects information in filenames in the "Artist - Title" format. If your filenames have a different format, you can download tags with Free Music Tag Finder. "Encoding of MP3 tags to save". Here you can select ANSI or Unicode. ANSI is more widely supported, but it depends on codepage and may fail to display national characters correctly. Unicode allows saving and displaying all national characters correctly, no matter what locale or codepage is used. However, some software and hardware may not support Unicode. Notification area - is the area of the taskbar near the clocks also known as "system tray". Various programs are represented as small icons there, but Windows may hide icons that it considers inactive. This option is not recommended for Windows 7 and later, unless you prefer it. Taskbar - is the main tool for switching between various running applications, normally at the bottom of the Desktop. Notification area and taskbar - this option is a combination of the two previous ones. After adjusting settings, click "OK" to close the window and save your new settings. Now you can start downloading lyrics for your MP3, FLAC, APE, OGG, and other music files.